Features two tunable diaphragms (adult and pediatric) for listening to both low and high frequency sounds. "Two-tubes-in-one design" helps eliminate tube rubbing noise. The pediatric side of the chestpiece easily converts to a traditional bell by simply replacing the diaphragm with the nonchill bell sleeve included with each stethoscope. Offers a solid stainless steel chestpiece, nonchill rims, and an adjustable doubleleaf binaural spring. 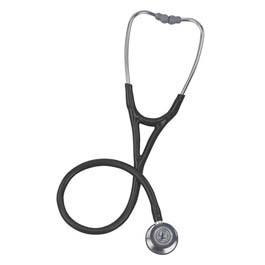 3M™ Littmann® Snap Tight Soft-Sealing eartips provide an excellent acoustic seal and comfortable fit.